9:00pm – The housemates are having dinner. 8:01pm – Miracle and Alex are still playing the dice game. 7:38pm – Nina is sleeping. 7:35pm – Alex and Miracle are playing the dice game. 7:24pm – Alex and Tobi are playing the dice game which ends with Tobi losing and stripping off all his clothes. 6:50pm – Alex and Cee-C are on the couch having a one on conversation trying to solve their differences following their fight that happened today in the afternoon. We hope they bury the hatchet. 6:43pm – The guys are inside the closet room playing table tennis. 6:25pm – Biggie is not impressed with the way the housemates have performed in the eggs’ challenge, he says they’ve failed the challenge. 6:17pm – Once again Big Brother throws in another dangerous substitute Alex, she is supposed to peel and eat 13 eggs in just 5 minutes. 6:04pm- Big Brother makes a substitute, Miracle is now standing in for Lolu as the ‘Fatest hands’ to peel as many eggs as he can. 5:51pm – Biggie has selected Lolu as the fastest hand and he only has 5 minutes to peel as many eggs as he can. 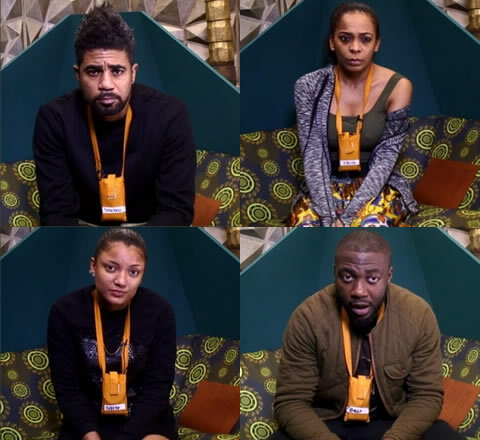 5:42pm – The housemates are in the arena for their second championship challenge of the day, the challenge involves cracking and eating boiled eggs..
4:44pm – All the housemates are gathered in the lounge and Head of House Miracle is reading out a brief for today’s second championship challenge. 4:36pm – Cee-C is in the kitchen giving company to Bambam and Rico Swavey who are preparing he housemates’ food. 2:59pm – The challenge ends with the housemates failing..
2:33pm – The housemates are in the arena for their first championship challenge of today..
1:59pm – Head of House Miracle reads out a task brief to his fellow housemates who are all gathered inside the lounge. 1:33pm – Tobi, Miracle and Teddy A are in the garden as the latter is smoking like he usually does. 12:32pm – Teddy A is eating his food while having a conversation with Bambam. 12:17pm – Majority of the housemates are sleeping. 11:59am – Tobi is quietly resting in the garden deep in thoughts. 11:05am – Lolu and Bambam are having a one on conversation. 9:17am – Housemates are having breakfast. 8:31am – The housemates are done with their morning workout session and have now left the arena. 7:50am – The housemates’ morning workout session begins. 7:46am – The housemates are in the arena for their morning workout session. 7:44am – Big Brother orders all the housemates to go to the garden and prepare to move to the arena. 7:19am – Lolu is doing some cleaning in the kitchen. 7:10am – Lolu is quietly seated in the garden alone. 7:08am – Big Brother asks the Head of House to please report to the diary room. 7:04am – Big Brother attempts to wake the housemates up. 7:00am – The housemates are still asleep. Good morning to you all and welcome to day 52 of Big Brother Naija Season 3, follow today’s Live Feed Blog for all the latest updates. You can as well check out yesterday’s highlights Here.